Cimerwa employees monitor the plant's production line (file photo). "Cimerwa can't produce enough cement, and they are very expensive. Yet the government maintains its shares there. They think we can stop cheaper cement from coming in so that they can sell?" President Kagame said. When he asked about the progress of the government's divestment, Prime Minister Edouard Ngirente said they had given PPC up to the end of the month to decide if they were buying out the government, otherwise they would go ahead and float them for sale to the public. Despite being in existence for more than 30 years, Cimerwa has struggled to cement its position in the market, but imports from the region--Hima cement from Uganda, Twiga and Simba from Tanzania and others--have progressively taken up its market, largely because they offer high volumes at slightly lower prices. The company controls up to 60 per cent market share--estimated at 600,000 tonnes annually--which has been decreasing in the past few years. "Cimerwa has a big market here that they can't even satisfy. They seem to be disorganised, they also don't know the politics of business. For instance, foreign companies give us cement on credit but Cimerwa doesn't," said Hakizimana Etienne, a cement wholesaler in Remera. 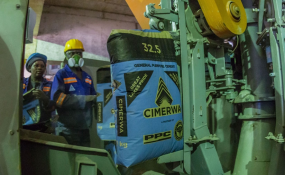 "Right now we don't have Cimerwa cement, many customers have been asking for it since morning, they have a new plant I have even been there but I don't know why their volumes are still low," noted a retailer who preferred anonymity.